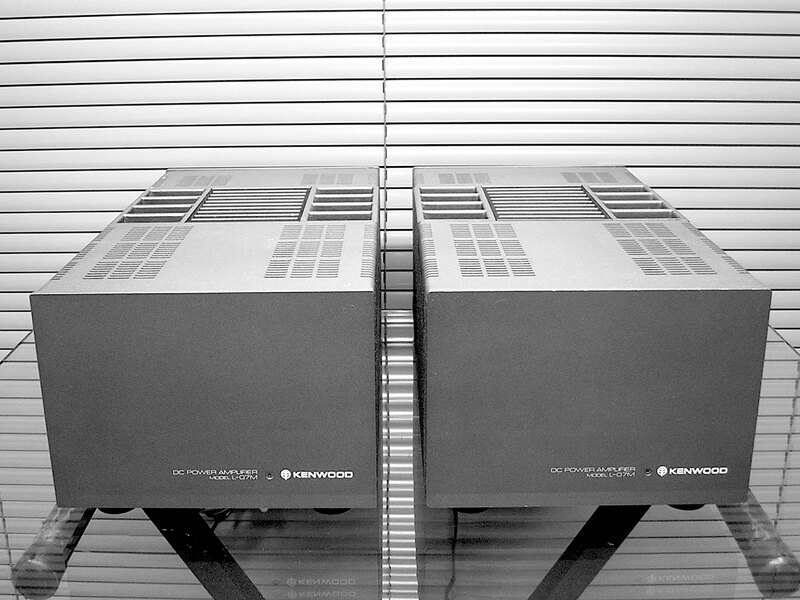 The Trio/Kenwood Stereo Control Amplifier Model L-07C and DC Power Amplifier Model L-07M monoblocs hail from a different age. Launched in 1979 at the very zenith of the audio boom, hi-fi was a hugely popular pursuit across the western world – and seen as one of the three essential things to own, along with a house and a car. Designed to be high end statement products with superlative build quality and performance, even by the best of today’s standards these boxes exude quality and class. The gorgeous matt dark-grey finish – neither bland nor regulation black – lends them an incongruously stylish and modernist appearance which has dated far less than many rival high end designs. Still, you’d never call them ‘beautiful’, and that’s why many well-healed hi-fi buyers of the day went for Bang & Olufsen’s stunning Jacob Jensen-designed 8000 series instead. The L-07C preamplifier’s fascia, replete with cutouts for rack mounting, is cleanly designed and set forward from the top plate by a smart wraparound sleeve. It has buttons for power, muting and subsonic filter, and bass, treble and master volume controls, plus tape monitor and an input selector (MM phono, MC phono, tuner and aux). Internally there’s a large covered transformer and power supply in a separated section. At the rear are sockets for the phono inputs, remote-in, high-quality pre-out phono sockets, both left and right ground connectors and a fixed mains lead. The unit measures 480x100x332mm and weighs a sturdy 7kg. The L-07M monobloc [pictured] is unusually heavy for its size, and a look inside explains why. Internally, behind the thick front panel is a massive covered power transformer and large reservoir capacitor bay. There’s a small power supply board with two large capacitors, with the output devices flanked by two substantial heatsinks which draw cooler air from underneath and convect the hot air skywards. At the rear of the L-07M are speaker sockets, ground connection, power switch and fixed power lead. Each L-07M measures 200x155x390mm, weighs 13kg and has a quoted power output of 150W of Class AB power into 8ohms, which was immensely powerful back at the time of its launch. Sonically, the combination sounds highly clean and detailed. There’s a wonderful lack of compression and the power amplifiers show absolutely no fear for any loudspeaker they are asked to drive – I would think this is one of the few amplifiers that could drive the heroically inefficient early ‘Series 80’ B&W 801 loudspeakers, for example! The experience of listening to this shows just how good a well done solid-state design can be, with seemingly limitless bass power, a wide and deep soundstage and crisp, sparkling treble. Although not exactly tonally warm, it’s never harsh and has a glassy clarity to the midband that invites the listener ‘through the looking glass’ and into the recording. The music always sounds clear and crisp and well controlled, with a massive punch when called upon so to deliver. Still, you wouldn’t call the Kenwood combination perfect; it’s very ‘Japanese high end’, which means it’s tidy, sophisticated and sounds ‘expensive’, but I still find its tonal colour a little monochrome. It cannot show up the differences between the sonic signatures of different recording studios particularly well, for example. Nor does it quite have the rhythmic flow of some other amplifiers, both tube and transistor. Overall, it’s stunning reminder of a better, vanished time – but this isn’t a universal panacea and at the prices some examples are selling for now, it’s poor value for money in performance terms.